Lewis Hamilton scorched to a well deserved victory and took lead of the championship table, as Nico Rosberg fell victim to technical problems in Singapore. A miserable race doomed for championship leader Nico Rosberg as the German was forced to start from the pit lane, due to a steering wheel problem. Meanwhile, his team-mate Lewis Hamilton made a tremendous start to the race. The Brit scorched down the main straight with Vettel and Alonso in his shadow. Ferrari driver Alonso initially cut the first corner and the stewards put him under investigation but the Spaniard soon reverted back to third and let Vettel in front. Button and Magnussen ferociously battled it out in the middle order, and The Brit nearly forced his team-mate into the wall. 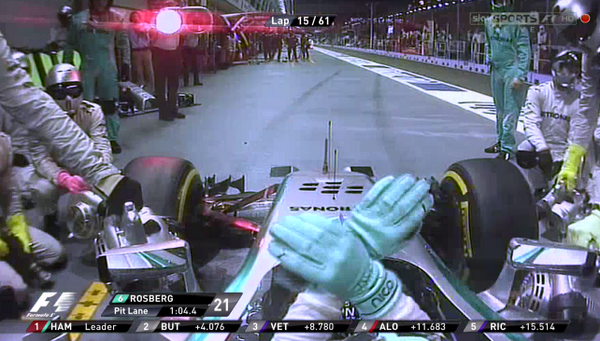 Rosberg's 10 lap devastation ended in dreadful circumstances. As he frustratingly strolled into the pits for a change, the German driver failed to get his car going again. He'd had enough, and waved everything off and indicated a retirement to cap off his miserable day. After lap 18, the top 10 drivers were as follows: Hamilton, Vettel, Alonso, Ricciardo, Massa, Raikkonen, Bottas, Button, Vergne, Magnussen. Vettel lead Alonso in 2nd, but the Spaniard, Alonso, clocked his personal best laptime. The two Red Bull team-mates. Vettel and Ricciardo both changed to soft compound tyres on lap 27. The tradition of safety cars interfering in Singapore continued, as Adrian Sutil's front wing shattered all over the track at the expense of Sergio Perez not realizing the German was attempting an overtake. As you know, the safety car bunches the pack up. Top 5 drivers at Lap 34: Hamilton, Vettel, Ricciardo, Alonso, Massa. Lewis Hamilton knew he had ground to make at the front since a tyre change was mandatory. It was sure HAMmertime as The Brit absolutely scorched away from Vettel and extended his lead to a second in just one sector. Astonishing. The Mercedes man was being instructed to drive another seven laps on his current tyres, but Hamilton was well aware of the risks in that. Tyre wear, or another safety car. In the middle order, Jenson Button was chasing Bottas for 6th place as the Williams' driver's tyres wore out. As we approached the final 10 laps, Hamilton had racked up a tremendous lead of 20 seconds but still with a stop to make. 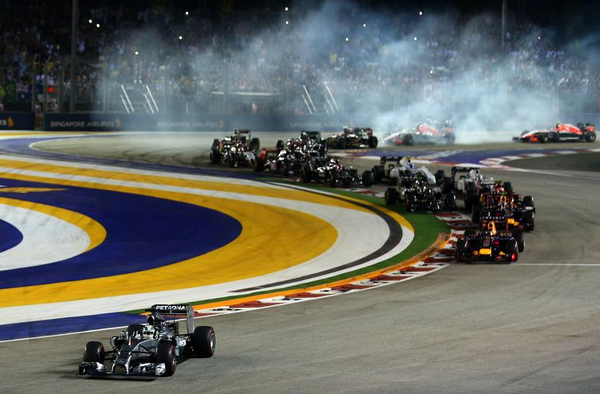 This set up a nail-biting finish to an eventful Singapore Grand Prix! Hamilton took to the pits and fell behind Vettel which set up a fascinating battle between the two! There it was! Lewis Hamilton reverted back into the lead, with fresh tyres along with the quickest car on the grid. The one-time world champion used DRS to scorch past Vettel and let the British fans breath once again. Lewis Hamilton WON the Singapore GP having pitted late on and flew past Vettel to take the LEAD in the championship table! What did you think of this fascinating Grand Prix - can Lewis Hamilton go on to win the drivers championship?